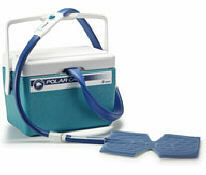 The Polar Care 500 unit is the flagship model of BREG's Cold Therapy product line. This unit utilizes a unique in-line thermometer and flow valve allowing the PC 500 to provide accurate temperature control at 45° and above. At 11 quarts, the Polar Care 500 has the largest capacity cooler of any single-patient use, motorized Cold Therapy unit on the market and can provide 8 to 11 hours of continuous-flow cold therapy with each ice change. Immediately following injury or trauma. Before and/or after physical therapy sessions.